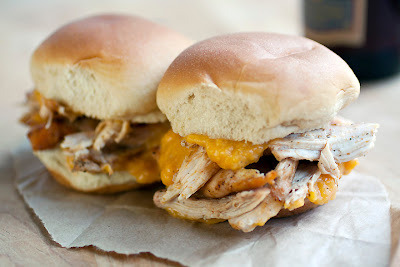 If you can buy skinless boneless chicken thighs your job will be quick and painless. If not, chicken thighs aren’t too hard to prep. Here’s a 5 minute video on how to skin and bone chicken thighs just in case. You'll save a little cash too by doing the work yourself. You’ll need a food processor for the apricot spread. If your store apricots aren’t fragrant and ripe (or you just want a shortcut) use two 8.25-ounce cans of apricot halves in light syrup. Drain and rinse off the syrup before grilling. 1. Spray the grill with cooking spray and heat to medium high heat. 2. Combine first 4-ingredients in a small bowl. Spray chicken with cooking spray and rub with the paprika mixture. Set aside. 3. Grill chicken and apricots about 5 minute per side until the chicken is cooked through. The apricots may finish a little sooner. 4. Cool chicken slightly and shred with forks. Place the apricots in a food processor with mustard and garlic. Process until smooth. 5. Warm the buns in the microwave. Spread a little chutney on buns. Add chicken and sandwich together. Calories 430. Fat 11g (Sat 3.7g, mono 4.1g, poly 1.7g); Protein 42.3g, Carb 41.9g, Fiber 2.7g, Chol 141mg, Iron 2mg, Sodium plus 644mg, Calc 24mg. Recipe adapted from the June 2011 issue of Cooking Light. Photograph by Laura Flowers. Today’s recipe comes from one of my favorite sites, MomsWhoThink.com. I appreciate their healthy weekly menu section and have been utilizing it more lately as I branch out and cook new healthy dishes. I used Annie’s Roasted Garlic Olive Oil, but if you don’t want to purchase a bottle for this recipe go ahead and use regular olive oil. 1. Cook the pasta in heavily salted boiling water until done to taste. Set aside your pasta water at the end of cooking time. Drain pasta and move it to a large bowl. 2. Tear off each little knob (it's really called a beard) on the side of the scallops if they're still attached. Slice each scallop in half so you have two thin rounds. Set aside. 3. Over medium-high heat in large nonstick skillet add the oil and scallions and cook until the scallions are softened. About 3 to 4 minutes. Add the tomatoes with their juices and cayenne if using and bring to a high simmer. Cook until the juices are mainly absorbed and the tomatoes are tender. 4. Turn the heat to medium. Add the shrimp. Cook until pink. Add the scallops and cook for 30 seconds to 1 minute. 5. Add the sauce and basil to the pasta. Gently toss and add pasta water as needed to make the dish saucy. Season with salt and pepper to taste. Servings 8. Calories 369. Protein 29g. Carbohydrate 48g. Fat 6g. Recipe adapted slightly from http://www.momswhothink.com/. Picture by Laura Flowers. This is not a Cooking Light recipe. Aren’t you amazed? I have branched out a little from my “cooking from the books mood”. 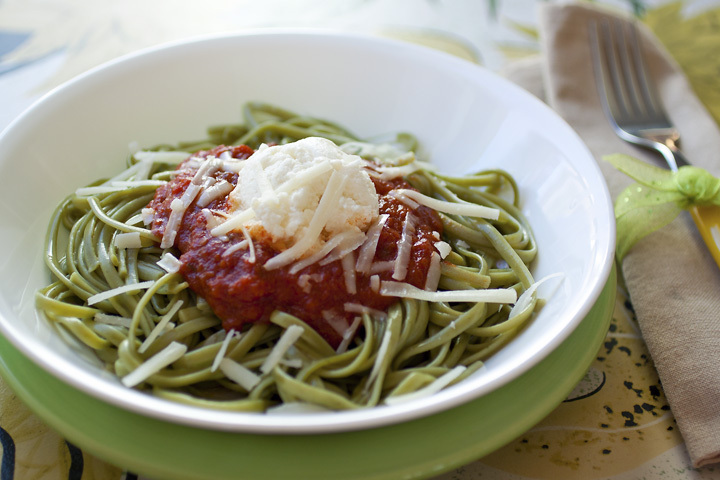 This recipe is from Judith Barrett’s book Pasta Verde. A simple little dish like this almost isn’t a recipe at all. 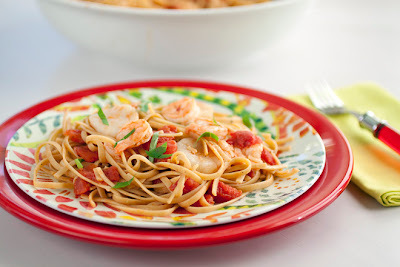 It’s so crazy simple, dinner can be ready in 15 minutes with the help of jarred tomato sauce. But if you want to make your own who am I to stop such greatness? So I’ve included a recipe for that as well. The red white and green is fun to eat. I used Lucini’s Rustic Tomato and Basil Sauce, but feel free to make your own. If you want a protein in here I’d suggest slices of freshly grilled chicken breast sprinkled with salt, pepper and a little garlic and herb flavored Mrs. Dash. 1. Mix together the ricotta and cream cheese. Set aside. 2. Add the salt to a large pot of water. Bring to a boil and cook pasta according to package directions. Drain. 3. Place the sauce in a pan and cover, cook over medium-low heat until warmed through. 4. Place pasta in individual bowls. Top with sauce, a dollop of ricotta mixture and sprinkle with Parmesan. 1. To peel the tomatoes: Bring 2 quarts of water to a boil in a large saucepan. Place the tomatoes in boiling water for exactly 1 minute. Drain in a colander and allow to cool slightly. 2. With a pairing knife, cut away from stem end of the tomato and peel off the skin. The skin should slip off easily. If it does not, place the tomatoes back in boiling water for another 30 seconds. 3. Cut around the inside core with the knife, and gently squeeze the core and seeds out. Hold the tomato under cold water to flush out remaining seeds. Coarsely chop the tomatoes. 4. Heat the oil in a large skillet over medium-high heat. Add the garlic, stir and cook for 30 seconds. Stir in the tomatoes. Liberally season with salt to taste. 5. Reduce heat to medium and cook, stirring occasionally, until the watery liquid in the tomatoes has cooked away, about 20 minutes. 6. Turn off heat. Taste for salt and add more if needed. Add chopped basil. Recipes adapted from Pasta Verde by Judith Barrett. Picture by Laura Flowers. Yes. It’s another Cooking Light recipe. This one is incredible and you’ll wonder why you ever paid good money at a restaurant for chicken curry. The secret is the large amount of fish sauce. Just throw it in, don’t smell it. Just do it. My friend Raman brought me a package of hot curry powder awhile back and I was grateful to have it on hand for this dish. I’ve said it before, but foodie friends really are the best. And congratulations to Betty at Scrambled Henfruit. It was so hard to pick just one person, as the answers were powerfully motivating and important, so I relied on the number generator. I hope Betty gets as much use out of the Cooking Light book as I have! 1. Combine the sauce ingredients and set aside. 1. Cut chicken across the grain into 1/4-inch slices; cut slices into 1/2-inch-wide strips. Cut strips into 3 inch long pieces. 2. Heat a 14-inch wok or skillet over high heat. Add 1 tablespoon oil and swirl to coat. Add half the chicken to the pan and stir fry for 2 minutes. Spoon chicken into a bowl. Repeat with 2 more teaspoon oil and remaining chicken. 3. Add remaining 1 teaspoon oil to the pan, swirling to coat. Add onion and stir-fry until lightly browned. Add ginger and garlic and cook for 1 minute. Add curry powder and chilies and stir-fry for 30 seconds. Add sauce and chicken and cook for 3 to 4 more minutes until the sauce begins to reduce. 4. 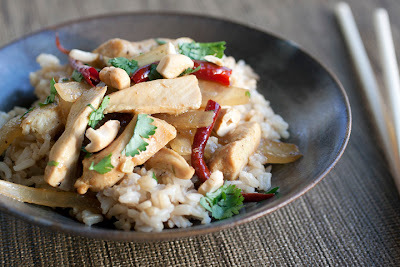 Spoon curry over rice and sprinkle with cilantro and cashews. Recipe instructions adapted slightly from Cooking Light Way to Cook. Pictures by Laura Flowers. 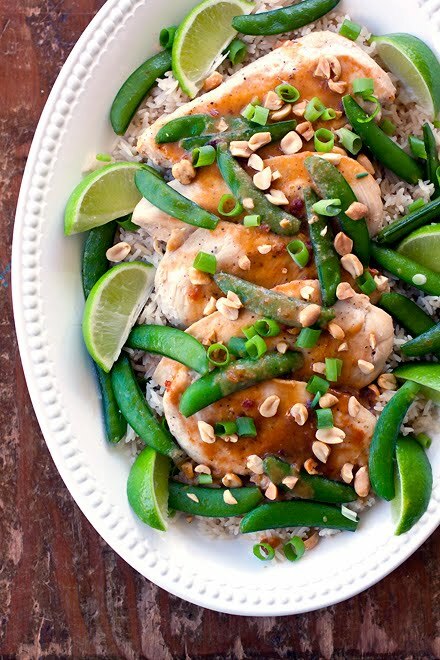 I think I’m becoming a little too obsessed with trying out all these recipes from Cooking Light. Here’s one from their June 2011 issue. I used yak instead of beef for this burger. It’s healthy and lean and we have access to it locally. You could use anything you like here. Bison, beef or even a good hearty veggie burger would be great. The trick to juicy burgers with leaner cut meats is to sear the outsides, then turn the grill to medium low and cook slowly until the burgers are done to preference. 2. Combine blue cheese, mayonnaise, 1 teaspoon thyme and hot pepper sauce in a small bowl. Stir well. 3. Spray cooking spray on onion slices. Sprinkle with 1/2 teaspoon pepper and 1/4 teaspoon salt. Coat the grill with cooking spray and cook onions until their tender and start to brown. 4. Place the onions, vinegar and 1 teaspoon thyme in a gallon sized plastic bag and seal to steam onions for 5 minutes. 5. Divide meat into 4 equal portions, shaping each into a 1/2 inch-thick patty. Spray with cooking spray. Season with 1/2 teaspoon pepper and 1/4 salt. Press an indent into the middle of each patty with your thumb. 6. Sear patties on both sides. Turn the heat to medium low and cook until burgers are done to preference. 7. Spread bottom buns with blue cheese mixture. 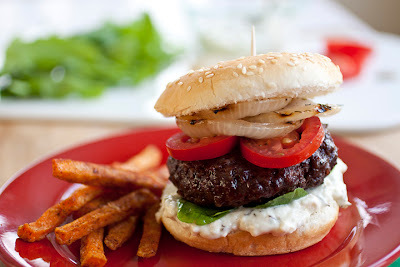 Top with arugula, tomato slices, burgers, onions and the top bun. Yield: 4 burgers. Calories 420 Fat 21.8g Protein 31.5 Carb 26.7 Fiber 4.2 Chol 76mg Sodium 623mg. Recipe adapted from June 2011 issue of Cooking Light. Picture by Laura Flowers. This was my first attempt at oven “frying” breaded fish. Traditionally I break out the deep fryer for perfectly golden results, and I was surprised to learn there wasn’t a great deal of difference in taste by baking. The clean up was easier too with no messy oil to deal with after. 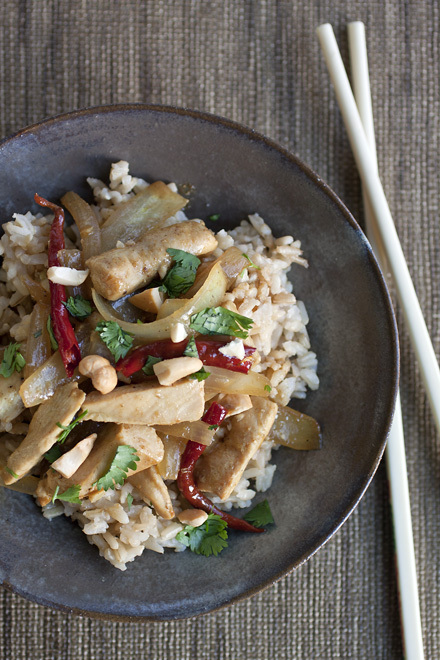 This adapted recipe comes from Cooking Light Way to Cook. For a chance to win this book, leave a comment on Wednesday’s post. If you have a convection oven, this is a great recipe to use it with. 1 teaspoon salt, divided. Plus more for seasoning. 1. Preheat oven to 450. Place a piece of tinfoil over a baking sheet and place sheet in the oven. 2. In a small bowl: Combine relish, chopped capers, 1/4 teaspoon salt and pepper sauce in a small bowl. Stir to combine. 3. In a wide shallow bowl: Combine flour, paprika 1/2 teaspoon garlic powder, 1/4 teaspoon salt and 1/4 teaspoon black pepper. 4. In another wide shallow bowl: Beat egg whites until they break apart. Add a small splash of water if needed. 5. In another wide shallow bowl: Combine cornmeal, 1/2 teaspoon salt and 1/4 teaspoon garlic powder. 6. Dredge fish in flour mixture, then egg whites and lastly cornmeal mixture. Shake off the excess after every dip. 7. Carefully take the hot pan out of the oven. Spray it with cooking spray. Place the fish on the pan and quickly spray the fish as well. Bake for 6 minutes. Flip, respray and cook for about 6 more minutes or until fish flakes with a fork. 8. Pile on the sandwich toppings and serve. Makes 4 servings. About 431 calories per sandwich with 16.2 grams of fat. Recipe adapted from Cooking Light Way to Cook. Picture by Laura Flowers. I haven’t posted a pizza in awhile and thought one might be fun. I also have a lamb pie my Greek-American friend Mari and I created together on her visit a few months ago. I promise I’ll get off my backside and share it with you soon. Grilled pizza is a ton of fun to make, but make sure to set aside at least 1 1/2 hours from the start of the dough to the finished pizza. 1. Place the tomatoes on a paper towel lined plate. Salt well, cover with another paper towel and set aside. Preheat the grill to high. 2. Sprinkle a 12 to 14 inch pan with cornmeal. Pat and roll out the dough until thin. Place dough on the pan and brush with olive oil. Spoon on sauce to taste. 3. Sprinkle cheese over the sauce. 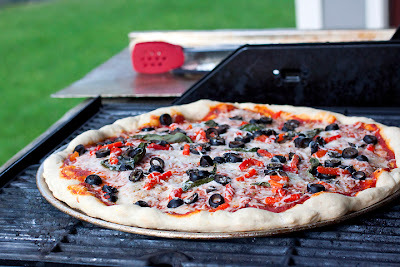 Top with basil, olives and pimentos. 4. Sprinkle with salt, pepper, garlic powder, onion powder, dried oregano and red pepper flakes if using. Drizzle with olive oil. 5. Cook pizzas for 4 to 8 minutes until done to taste. Makes enough sauce to cover three medium, or two large pizzas. Place all the ingredients in a medium sized bowl and stir together. Makes 1 1/2 cups of pizza sauce. Recipes and photograph by Laura Flowers. 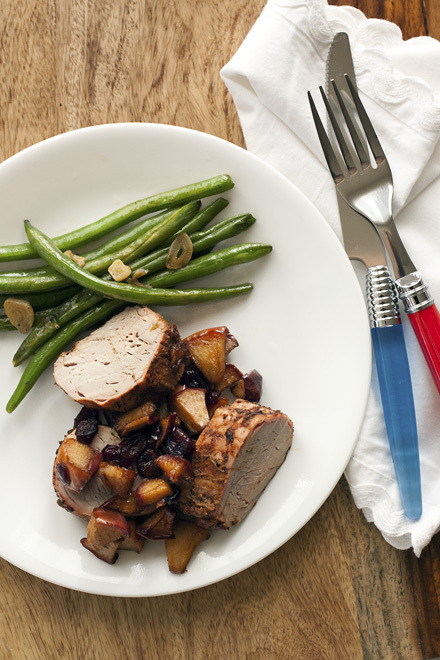 Here’s a healthy dinner idea with a recipe for leftovers. This week, because I love this book so much, I’m almost entirely cooking out of “Cooking Light Way to Cook”. I decided you need this book too. So I’m going to give it away to the person who gives me the best answer. I’d like to know how you’re becoming or staying healthy and how this book can help you. I’m trying to be healthier too and need your support. I’m hoping your thoughts will get me through these stricter life changes. Please leave a comment. I’ll let the winner know on Friday the 22nd, so leave me a way to contact you. Printer Version, all three recipes. This recipe was so much fun to make and tasted fantastic. The directions originally called for chops, but I doubled the spice rub and made two pork loins. There was plenty of chutney for both. You can make chops instead if you prefer, but reduce the rub by half. 1. Core the apple and cut it into slices. Cut those slices into thin wedges about 1/4 inch thick. 2. Melt butter over medium-high heat in a nonstick skillet and add the apples. Saute for about 5 minutes or until the apples are lightly browned. 3. Add the rest of the ingredients and bring to a boil. Reduce the heat and cook until the liquid is gone and the apples are tender. 1. Turn the grill to medium-high. Rinse pork loins and pat dry with paper towels. Set aside. 2. In a small bowl, mix together all of the spices. Spray the pork with cooking spray and rub all over with spice mixture. 3. Grill, flipping once, until a thermometer reads 160 degrees in the center. Remove pork from the grill and rest for 10 minutes. 4. Cut pork into rounds and serve covered with chutney. If you green beans are pretty thin and young you can use this method to pan fry them. If they are thick, boil them for a few minutes and drain well before starting this recipe. 1. Heat oil in a nonstick skillet over medium to medium-high heat. Add the beans and cook for about 5 minutes. Turn the heat down if they oil starts to splatter. 2. Add the garlic, salt and pepper and cook until the garlic is lightly browned. This is my favorite part of this meal. 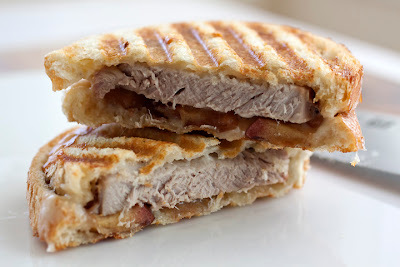 These sandwiches are incredible and I’m so sad I’m out of both pork and chutney. If you anticipate leftovers, grab a loaf of thinly sliced French-type bread and some Havarti. If you don’t have a panini press, just grill in a skillet. Just be careful your fillings don’t fall out when you flip the sandwich over. Preheat your panini press to medium high. Lightly butter the outsides of bread. Place one slice butter side down and spoon on chutney. Add some Havarti, then pork and a little more Havarti. Top with another slice of buttered bread. Grill to melty-gooey happiness. Pork recipe & green beans adapted from Cooking Light Way to Cook. Sandwich & photographs by Laura Flowers. "Hello...“Dishboy” Scott again. To those old timers who know and love “Dishboy”, I send warm greetings! For those of you who are newer and are wondering who this strange poster is…well you can read more about me by clicking up there in the “Favorites” navigation link at the top of the page. Anyway, I just love being able to just jump in occasionally and ride on the coattails of someone else’s hard work and talent. Thanks, Laura, for letting me “guest blog” today. I am happy to be able to visit with you all again. Laura has been waiting (semi-patiently) for me to post my spaghetti sauce recipe for some time now. I think I’ve been promising her that I would post this recipe for at least a year. Well, here it finally is! 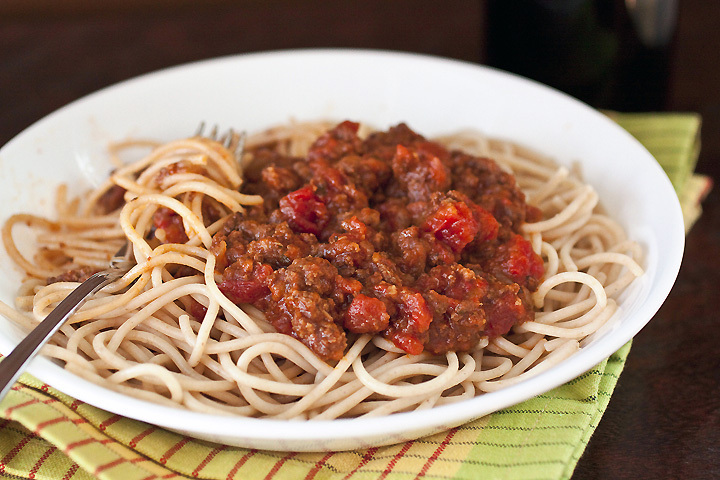 This sauce recipe is quite yummy, and very easy. If you want this recipe to turn out like it is intended, you MUST remember this key thing: There is something special that happens when you cook tomato-based sauces all day. I’ve mentioned this to you before, and it is critical as you cannot duplicate the taste any other way. 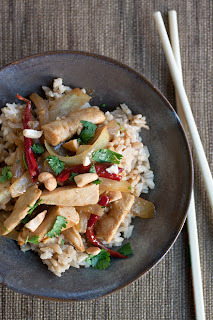 I strongly recommend that you make this as I do, by cooking it all day in a slow cooker. The goal is to cook it long enough that you are getting a heavily caramelized sauce sticking on the side of your Crock-pot. I use an oval 5.5 quart Crock-pot, and this starts to occur when it has been on high for around 5-6 hours (although I have noticed that some slow cookers don’t get as hot as mine and it takes longer for this stage to occur). Please do not be afraid of this caramelized residue…it is the secret of this sauce! Once it starts forming, I scrape the sides with a rubber spatula and stir this back into the sauce. I try to do this several times, once more caramelized residue has formed." 1. In a large skillet, cook the meat and onions until the meat is brown and the onions are tender. Add the minced garlic near the end of this step to prevent it from burning. 2. Place meat mixture (without draining) and all other ingredients into a large crockpot. I like my spaghetti sauce less thick, so I do not drain the tomatoes. If you like a thicker sauce, then I would recommend draining them before adding. 3. Cook on high for at least 5-6 hours, or low for 10-12 hours, stirring caramelized sides back into the sauce. As the sauce is nearing completion, it should be easy to skim off any fat with a tablespoon, as the fat will pool on top while it simmers. 4. When complete, stir well, and serve on top of your favorite pasta. Recipe by Scott Bader. Picture by Laura Flowers. I hope you’re having a nice 4th of July weekend. I’m visiting family, but I admit I’d love to sneak onto the nearest post or base and see how our military is celebrating this year. My very favorite 4th of July memory is the year I was on lockdown at basic training. For one special night we were allowed a little supervised freedom to celebrate this important holiday with our platoons. I’ll never forget that moment of clarity, finally understanding how important being an American was to me. To this day I never fail to be moved by a patriotic act. So if you have sons, daughters, husbands, wives, brothers or sisters in basic training this holiday don’t worry, they’ll be on a field somewhere watching the fireworks and drinking that giant soda they’ve been denied for weeks! Of course, they won’t be eating a healthy salad pita like this one. You can bet it’s pizza night on post. Ah, memories of being able to eat whatever I wanted! Though this is a nice salad for a picnic, a healthy lunch or a fast 4th of July meal. For a vegetarian version substitute a peeled, seeded and chopped cucumber for the chicken. 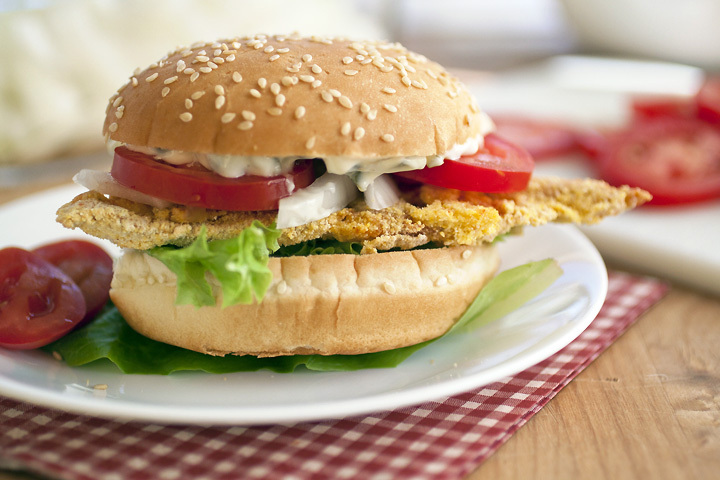 For a vegan meal, do the same but add vegan mayonnaise in place of the standard fare. This is so quick and easy I don’t want you to think about measurements. Just mix it all together to your taste preference. 1. 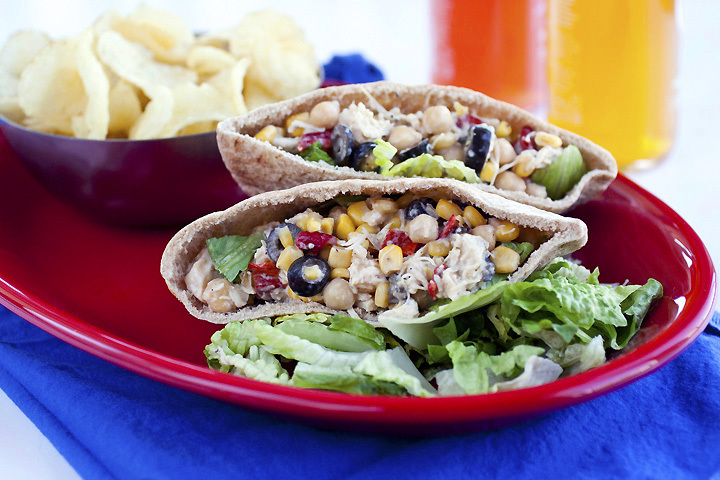 In a large bowl, mix together the garbanzo beans, chicken breast, corn, olives, and peppers. Season with salt, pepper and Mrs. Dash seasoning to taste. Mix in just enough mayonnaise that the salad is coated. 2. Wrap the pitas in a couple paper towels. Place them on a plate and microwave until warm, about 30 seconds. Place some romaine lettuce in each pocket and fill with salad mixture. Serve immediately or wrap in plastic and pack away for a picnic. As I gear up for the making of 4th of July pies I thought I’d share the one closest to my heart with you. My mother’s. I have a picture of her cherry pie around here somewhere, but can’t find it right now. It’s just a quick little snapshot, but I wanted to share it anyway. Mom’s pies are way more fun than mine because she always places dog bone pie dough shapes on top. Don’t ask my why, I have no idea. But they make me laugh. If I find the picture I’ll post it later. All I have for now is my own prep shot. Growing up, this was the pie we waited for. Sometimes she used Oregon Fruit from the cans and other times I’d help her pit fresh pie cherries from the backyard tree. I still anticipate this favorite cherry pie and wondered until recently, why her pie is better than mine. So one day I called and asked if she’d share the recipe. “Sure” she said and started to rattle off the few ingredients. I wrote them down and hung up the phone. Looking at my little note I noticed there were two whole cups of sugar. A misprint I thought. So I called her back and asked. “No, it’s two cups.” I was told. And then I thought back to all the pie I consume as a child. I must have lived entirely on sugar! Oh well, it’s too late to take it back now. Besides, this pie is special enough it’s worth the sugar load now and then. 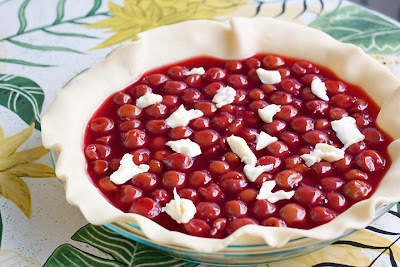 Since we make cherry pie all year long I’ve added the instructions for fresh, frozen and canned pie cherries. The pies will taste about the same no matter what state your cherries come in. You’ll need a 9 1/2 inch pie dish and pie crust shield or foil for edges. 1. Drain the juice from one can of cherries and discard the juice. Drain the juice from the other can into a large pot. 2. Mix together sugar and flour (don’t skip this step or you’ll have lumpy flour pieces) and add it to the pot. Heat the juice over medium-high stirring constantly until well thickened, about 20 minutes. Turn off heat and stir in the cherries, almond extract and a few drops of red food coloring if using. Cool to room temperature. 3. Place the oven rack in the lower third of the oven and heat to 425 degrees. Place the dough into a 9 1/2 inch pie dish. Pour in the cherries and dot top with butter. Top with the second dough, flute edges, cut vents into the top and sprinkle with a little sugar if desired. 4. Place the pie in the oven and bake for 30 minutes. Place a pie crust shield on the pie and turn the heat down to 375 degrees. Bake for 20 to 30 more minutes until the crust is golden and the filling is bubbly. Cool for several hours before serving. I’ve reduced the cherries a little from my mother’s recipe to fit them into a 9-inch pie. This recipe needs a 9-inch pie dish and a pie crust shield or foil for edges. Also, fresh cherries need more water to get the liquid started then frozen. Be prepared to adapt a bit as you go. 1. Thaw the cherries if frozen. Place cherries and any juice (if thawed) in a large pot. 2. Mix together sugar and flour (don’t skip this step or you’ll have lumpy flour pieces) and add it to the cherries. Add 2 tablespoons of water if there is little juice. Add another tablespoon or two if needed to help the sugar along. 3. Heat the over medium-low stirring gently to not crush the cherries until well thickened, about 20 to 30 minutes. Turn off heat and stir in almond extract. Cool to room temperature. 4. Place the oven rack in the lower third of the oven and heat to 425 degrees. Place the dough into a 9 1/2 inch pie dish. Pour in the cherries and dot top with butter. Top with the second dough, flute edges, cut vents into the top and sprinkle with a little sugar if desired. 5. Place the pie in the oven and bake for 30 minutes. Place a pie crust shield on the pie and turn the heat down to 375 degrees. Bake for 20 to 30 more minutes until the crust is golden and the filling is bubbly. Cool for several hours before serving. Note: If the pie starts to drip in the oven, place a foil lined baking sheet on a rack under the pie. Click here for a printer version for both variations. Recipe via mom Linda Komberec. Picture by Laura Flowers.